The Golden State Warriors aren’t the only basketball team ready to play fast and drop 3-pointers, Eastfield Head Coach Anthony Fletcher said. That style, he says, relies getting uncontested, high-percentage shots, preferably from behind the 3-point arc. It requires players to be unselfish, giving up their opportunity to score for a teammate who has a better opportunity. Fletcher’s teams run a high-paced, complex offense. He says the incoming freshmen should be fully integrated and have an understanding of the scheme by the time conference play opens. 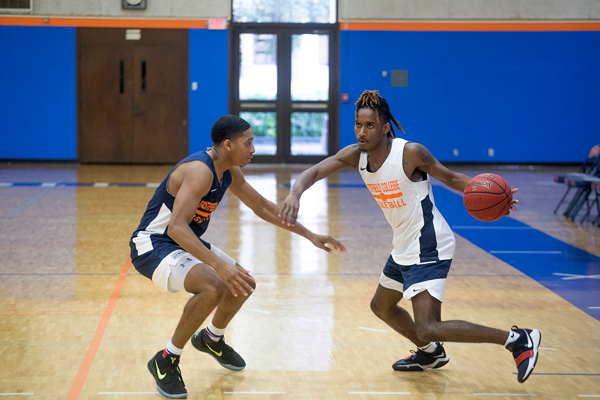 The Eastfield men’s basketball team is currently undefeated in scrimmages against NAIA, DI and DII junior colleges coming into the 2018-2019 regular season. The Harvesters have won the conference tournament in four of the past six seasons, but last year was not one of those. They lost to North Lake in the conference championship 76-88. The Harvesters will be leaning on veterans like McGee early. McGee is the school record holder for 3-pointers made in a game with 11. The second leading scorer last year, McGee was named to the All-Region third team after scoring 13.8 points per game. Another key returner is guard Rashaun Coleman, who was named to the All-Region second team last season and is one of the team captains this year. “He isn’t a very vocal guy, but he leads with his play on the court,” Fletcher said. Forward Scott Garriga is a captain who is more “positive and vocal,” according to Fletcher. Garriga will be one of the pieces Fletcher has brought in to replace the production that departed during the summer. The team lost their leading scorer from a year ago in guard JJ Murray, who transferred to the University of North Texas after averaging 18.9 points per game. He was also an elite defender, leading the team in steals and rebounds. Eastfield also lost guard Sean Odum, who was fifth on the team in scoring and one of the better inside scorers. They also lost rotation players Kuol Arop at forward and guard Adevonte Johnson. The basketball team faces a unique schedule that the other sports on campus don’t. The season starts at the end of October and runs through March. The players have a three-week break in December in the middle of their season. Fletcher believes that this break hurts the development of some of the newer guys on the team. Fletcher said his teams have a numerous amount of plays in their playbook. That high play count doesn’t really come into effect until after the break. Fletcher believes his team has all the pieces. They have the leadership. They can get out quick and score. They are dangerous from behind the 3-point line. Most importantly, they can play defense.